During the final production year of the Mignon 4, a last model was introduced, under the new brand name Olympia: the Olympia Plurotyp. 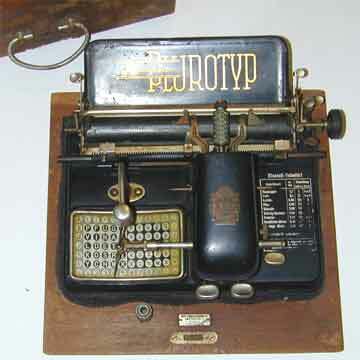 The Plurotyp was an improved version of the Mignon 4 with adjustable spacing and a spring-driven strike mechanism for even printing. Special large character cylinders were available for the Mignon 4, but to use them, the writer had to insert one space extra after each character to avoid overlapping the letters. The Plurotyp solved this problem with a rotating rod in the back of the carriage that controled the escapement. (Pic 5) The writer could choose three different settings. The strike of the type cylinder was handled with a spring, the tension of which was controlled with a knob on the right side of the mechanism cover (Pic 4). A table of settings printed to the right of the cover gave complete instructions on which settings to use for which fonts and sorts of work. It is unknown how many Plurotyps were built, but only three are currently known in collections. Known serial numbers fall in a range of less then 1500 machines, which include mostly Mignon 4s.